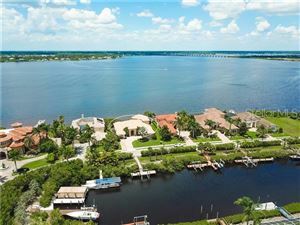 If you are looking for spectacular waterfront real estate located just minutes away from Downtown Bradenton, you should look no further than the eastern banks of the Manatee River just west of I-75. This is where you will find Hawk Island, one of the newest and most exclusive waterfront communities in Manatee County. Hawk Island is not really an island in the sense that its southwestern end is connected to the mainland by means of 36th Street NE; still, this riverside neighborhood is surrounded by two deep water canals that serve as private dock space for homeowners. Hawk Island is actually an exclusive yacht club, but membership is not mandatory; all the waterfront estates have been custom built by Arthur Rutenberg and Bamboo Homes, two of the most upscale residential developers in Florida. There are only 28 properties on Hawk Island, and all of them are very special. To get an idea of just how magnificent these waterfront estates are, consider this recent listing: two levels, four bedrooms, five full bathrooms, a five-car garage, 5,842 square feet interior, two guest restrooms, private dock space, wine cellar, gourmet kitchen , game room, outdoor kitchen next to the swimming pool, wet bar, spa, and even a private pier for fishing and enjoying the sunset. The best adjective to describe the homes in Hawk Island would be: palatial. This is a neighborhood that you must visit if you are searching for the very best in waterfront lifestyle. If you are serious about boating, you will certainly enjoy being able to cast the lines right behind your house and maneuver your vessel out to the Manatee River, Terra Ceia, Anna Maria Island, the Tampa Bay, and the Gulf of Mexico. Whenever they are not enjoying the water, residents of Hawk Island can be found enjoying the suburban comforts right outside their neighborhood, where chain restaurants such as Applebee’s and the Outback Steakhouse are located within an elegant and convenient shopping center. See all Hawk Island Bradenton Florida Homes for Sale.